The villa sleeps 2-14 persons. This villa has just been re-furnished with all brand new furniture! Two lounges/family rooms are downstairs and another upstairs for quiet relaxation for reading, watching some TV or playing on the WII game console. It also has 6 large bedrooms, 4 ½ bathrooms, & and a large private sunny pool. TWO MASTER ENSUITES (King & Queen size beds), 3 large bedrooms have Queen size beds and a bedroom with two twin size beds. Also 2 pull out sofas if needed. All bedrooms have TV's. Our kitchen is equipped with everything you need from making a snack to preparing an entire family meal, with formal and informal dining areas. 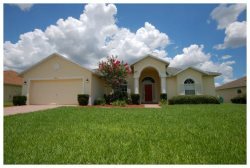 This home is ideal for larger families or families vacationing together as it offers sleeping accommodation for up to 14 guests, and offers plenty for everyone, let alone the park attractions Florida has to offer. Everything you will need is in the villa, clean bed linens, towels, washing machine, drier, etc... The pool has a removable safety fence for added safety for children. We also have free wireless broadband internet & free phone calls within the US & Canada We have a game room with a pool table, air-hockey, table tennis & darts. This 6 bedroom luxury villa in Avianas exclusive private and gated community, just 25-30 minutes from Orlando International airport and within 10 miles of Walt Disney World. Aviana resort sits in an oasis of swaying palms, with rich green foliage and exotic flowers. Aviana offers guests the ultimate stay in a relaxing retreat from the hustle and bustle of Orlando's exciting attractions. Whilst staying in the Aviana community there are many free amenities to take advantage of. There is a large clubhouse, including a large swimming pool, spa, fitness centre, business centre, free internet access, sand volleyball, children’s playground, putting green, and picnic area. Aviana also has several paths for enjoying short walks around the resort alongside fishing lakes, with wildlife including birds. For golf lovers 5 minutes away is Providence 18 hole golf club and only 10 minutes away is Champions Gate golf resort, a nationally acclaimed golf facility for world class golf with 36 holes. We are sure you will have a brilliant stay in this villa and have lots of magical memories to keep and look back on.